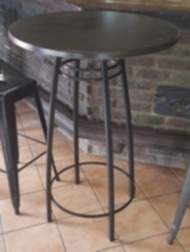 Bar table suitable for bars, functions, pubs and entertainment areas. Jennifer base with a 800mm diameter werzalit top. ROI Restaurant & Office Furniture offers the most affordable, quality furniture available in South Africa. Buy your restaurant furniture online, kit out cafes, hotels, pubs, bars, or even your office and home.